Our family has been struck by Alzheimer's disease way too many times for us to surrender without a fight. Our grandmother had Alzheimer's diesease in her 60's, so did some of her siblings. Our dad was diagnosed with Early-Onset Alzheimer’s Disease at the age of 56. Carlos Santos was a no non-sense but caring kind of guy. He was an attorney-at-law and a Wesleyan pastor. He served in the National Guard and the Army Reserve for about 20 years. He always cared for others and placed their needs before his own. He was married to his HS sweetheart, Gloria, until his last day on earth. Three children made the Santos-Cordero clan complete: Maribel, Nilsa & Carlos. Growing up we learned from our dad that love is being present, to do things right because it’s the right thing to do, and to love God above all. He passed away in 2012 at the age of 67. As the illness progressed, we watched a brilliant man fade away. The essence of who he was disappeared and was replaced by a man who would often get frustrated as he could not understand what was happening to him. Our mom had to go back to work when he no longer could. She then retired again to take care of him when he could no longer stay home by himself. Our family chose to keep dad home and mom remained the main caregiver. We helped her as much as we could but the weight on her shoulders was almost unbearable. If you ask us, she is the true hero of this story. As caregivers, our family often felt helpless, hopeless and energy depleted. We are eternally grateful for the unconditional support of organizations like the Alzheimer’s Association and the Alzheimer’s & Dementia Resource Center who empowered us with knowledge and support to help us cope with the challenges of living with Alzheimer’s disease. We donated our dad’s brain to the Florida Brain Bank; a research program dedicated to scientific research of brain tissue donations with the ultimate goal of curing Alzheimer’s disease. The Florida Bank gave us the opportunity to obtain a definite diagnosis and provide a significant contribution to research. 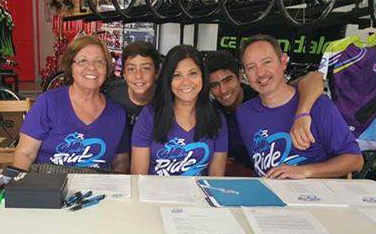 The Ride 2 Remember was created to honor the memory of our dad and other families who have had to struggle with this disease. We celebrate their lives and the incredible resilience of their caregivers. The first few R2R events were funded from our own personal contributions, local businesses and the goodwill of family and friends. Over the years, we have been able to donate net profits to local organizations like the Alzheimer’s Association, Florida Gulf Coast Chapter, Pines of Sarasota and The Roskamp Institute. As a non-profit organization, we are set on pushing research forward until we can celebrate survivors of this horrible disease. We now look forward to obtain an increased support from individuals & businesses and expand the amount of organizations who may benefit from our support. We appreciate your interest in the Ride 2 Remember and hope to see you soon!